PVREA Cooperative Solar | Poudre Valley REA, Inc. Instead of going through the hassle of putting solar on your roof or having to come up with large sums of money for upfront costs, be a part of your co-op’s community solar farm. The energy produced by your subscribed solar panels will be credited to your monthly bill. Affordable, easy, convenient, and hassle-free. Can’t afford the one-time initial payment? Members can opt into the Pay Over Time option. The $48/panel initial payment will be spread out over the course of 24 months at $2/panel/month. How many panels? What will it cost? What’s the benefit? Find out. Receive the benefits of clean, renewable energy for your home or business. Sign up for myLocal Solar. Community Solar is for everyone, whether or not you can afford it. There is room in the community solar farm for members who are income-qualified. The Co-op sends a newsletter of updates to our general subscribers. Shaded roof, live in an apartment or other obstacles? Community solar allows all PVREA members to participate in renewable energy, regardless of the set-up of their home or where they live. Perfect for renters who want solar energy. Coming together to build one, large central project reduces installation costs. Sizing is flexible—members can choose their level of interest to fit their budget. No obligation—members can opt out at any time. Members can save money throughout the life of the program. No hassling with maintenance—we’ll take care of that! No equipment at your home or business—these solar panels are centrally located and highly efficient to get the most out of the sun’s potential. See the credits and savings right on your electric bill. Your panels are located right in our community—the Coyote Ridge Community Solar Farm is at the Larimer County Landfill. This solar project was put together by your fellow co-op members, neighbors, and others from the community. When you enroll in myLocal Solar, it means you are getting a portion of the output of the solar energy the local community solar farm produces. Those who need assistance in affording solar may be qualified for the low-to-moderate income portion in the PV for All program. Income guidelines vary by county and the number of people in the household. Learn more here. Yes, anyone who pays their own electric bill to PVREA can participate in this program regardless of housing. Renters, homeowners, people who live in apartments, houses, condos, mobile homes etc. – anyone in PVREA service territory can qualify. If you move within the PVREA service territory and are just transferring your account, your subscription will move with you. If you are leaving the PVREA Co-op family, you can leave your community solar subscription at your old house for new co-op members. Call us at 970-377-6651 for more details on how to transfer your subscription. Questions? 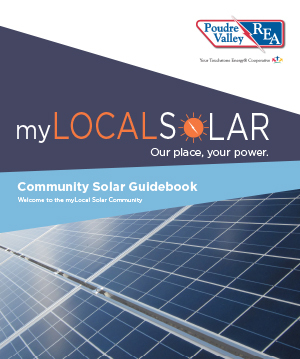 Call the Community Solar Line at 970-377-6651 or email us at mylocalsolar@pvrea.coop.